Whether there's a kitchen sink to install, a piece of wood that requires an intricate cutting pattern or some sheet metal that requires slicing in two, there's only one tool for the job: the humble, handheld jigsaw. The woodwork teacher's best friend and Craft, Design & Technology regular is ideal for cutting curves and complex shapes into wood, as well as tackling more complex sheet metal tasks, so long as you have the correct blades installed. As with all power tools, the more you spend on a jigsaw the longer it's going to last and the larger the job it can tackle. Like most Ryobi tools, the RJS750-G jigsaw is a great bit of kit. It's only a 500W saw, but the ergonomics and accuracy of it make up for the relative lack of power. Jigsaws vary wildly in price and capability, with the more powerful and expensive offerings able to cut deeper and faster into both wood and metal. On top of this, most models will also feature an adjustable action that controls the aggressiveness or smoothness of the cuts, while built in speed control in more expensive models will maintain the correct blade speed for a consistent finish. Like so many other tools, the modern jigsaw is now available in cordless variants, which makes them far more portable and easier to use in tricky places but they rely on batteries to be topped up and have limited run times. Finally, it's worth considering additional niceties found on some variants, including a dust blower that will keep the cutting line free of wood chips and dust for a super clean finish, as well as LED lights, cutting guides and easy blade exchange system. Ryobi claims this jigsaw boasts the "most visible cut line in the consumer market" thanks to its slim design and integrated blower that gets rid of dust to help you stick to marked lines. I won't comment on that claim because I haven't tried every jigsaw on the market, but I will say it is a mightily accurate slicer of wood, offering a neat flip-down plastic cut guide to help even complete novices create clean cuts. Said cutting guide can be a little fiddly to use and I found it could often just get in the way, but it is removable. So remove it, would be my advice. The unit itself isn't the most powerful, and can only cut up to 75mm into wooden surfaces, but it makes up for it by feeling light and comfortable in the hand, even after extensive usage. Those looking for a bit more versatility should also check out the One+ version, which uses Ryobi's 'one size fits all' Lithium-ion battery packs and does away with the need for a wall socket. Battery-powered jigsaws are usually a bit underpowered, but there's always an exception to rules if you have enough money. Makita's jigsaw manages to blend the portability of battery-powered tool with the sort of performance you'd expect from a top-spec corded rival. Highlights include a built-in job light for use in low visibility scenarios, a rapid 22-minute charge time and the sort of cutting depth in both wood and steel that is required on professional building sites. Dipping your toe into the world of jigsawing? Don't want to spend too much money in case you hate it? This Ozito model lacks some of the fancy gadgetry of more expensive rivals but it does the job without breaking the bank. Variable speed selection makes it easy to complete accurate and intricate cuts without risking splintering or wandering from a marked line, while the adjustable shoe (0 - 45 degrees) sees even tricky jobs completed. On top of this, there's a lock on button for extensive cutting tasks and a vacuum cleaner adaptor for getting rid of dust and debris from the worksite. 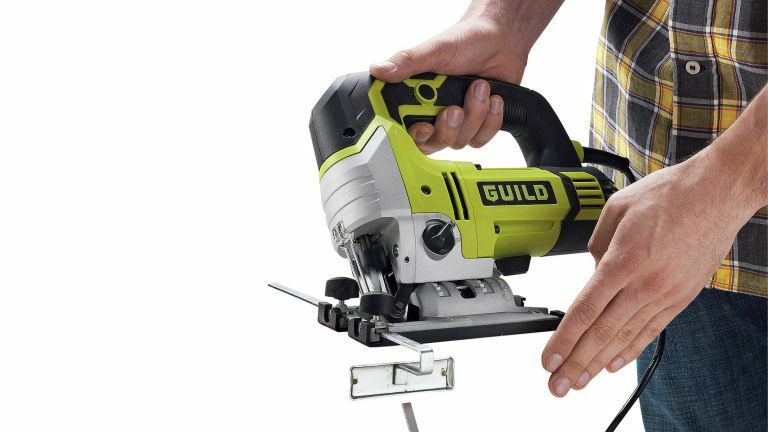 I'm always quietly impressed by the power tools offered by Guild, as they don't break the bank but boast powerful specification that tends to embarrass the pricier rivals. This bulky beast can cut into wood at a maximum depth of 100mm and 10mm into steel, while we found the rubber soft grip handle and built-in anti-vibration technology allowed us to use the tool for long periods of time without having our teeth shaken out. The three variable speed modes might seem a little stingy, and the cutting guide is fairly rudimentary, but it does the job and the tool feels very well built considering the minimal price. A battery-powered offering that maximises usability but lacks a bit of grunt, the Bosch PST offering is both lightweight and exceptionally portable but can irritate with its limited battery life and shallow metal cutting depth. However, the tool itself is exceptionally well built and comfortable to use over long periods, while the integrated cutting guide and blade guard make it simple to get clean results.